Every home OKC Thunder NBA basketball game is an unforgettable event for those who attend and become part of the excitement. Oklahomans are not just sports fans – they’re sports fanatics. With a vigorous pride for their favorite teams, they are far from “fair-weather,” and their enthusiasm adds to the electricity of Oklahoma’s sporting events. Sports in Oklahoma have been celebrated since before statehood in 1907. Now with football, hockey, baseball and basketball teams all exuding excellence, sports in the Sooner State are more exciting than ever. Experience Oklahoma’s sports heritage by attending a game or visiting one of many sports museums full of memorabilia. 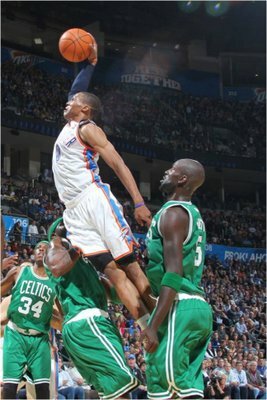 The Oklahoma City Thunder exploded onto the NBA scene shortly after taking up their new home at the Chesapeake Energy Arena in downtown Oklahoma City in 2008. In just three years, the Thunder grabbed the NBA Western Conference Champions title and built a fiercely strong following throughout the state. You don’t want to miss being a part of what has been called the most electric and loudest fan base in the NBA. Cheer from the sidelines or up in Loud City while you “Thunder Up” with Rumble the Bison, the Thunder Girls and the rest of Oklahoma City as superstars Kevin Durant and Russell Westbrook face off against competitors with the rest of the Thunder team. For more basketball action, see the Thunder’s minor league affiliate, The Oklahoma City Blue, play against other Development League teams at the Cox Convention Center. Formerly based in Tulsa, the team has been in Oklahoma since 2005 with an impressive 14 game winning streak in the 2010-2011 season. Oklahoma’s two major universities, the University of Oklahoma in Norman and Oklahoma State University in Stillwater, have a rivalry for the ages known as Bedlam. Competitive in everything athletic ranging from baseball and gymnastics to wrestling and softball, games between OU and OSU often decide conference championships. Both universities offer powerhouse collegiate athletics with over 75 combined national titles in all sports and six Heisman Trophy winners. There is one sport that stands apart from the rest in Oklahoma – football. Bedlam comes to a head when the Sooners and Cowboys meet for their annual match on the gridiron as sides are picked for bragging rights and nearly 90,000 fans root for their team in the crisp fall air. Rally around Sooner Magic or Orange Power and blend in with a sea of crimson and cream, or orange and white from the stands. Experience what fall sports in Oklahoma are all about as you tailgate and walk around a beautiful college campus. 'Thunder Up' with Rumble the Bison, the Thunder Girls and the rest of Oklahoma City as superstars Kevin Durant and Russell Westbrook face off against competitors with the rest of the Thunder team. If you love America’s favorite pastime, then downtown Oklahoma City is the place for you. The Chickasaw Bricktown Ballpark is a gorgeous spot to catch a game and has been recognized as one of the highest rated Triple-A facilities in the country. Originally named after the Land Run of 1889, the Oklahoma City Dodgers began as the 89ers in 1962. The team was renamed the RedHawks in 1997 before taking on the Dodgers name in 2014. They have drawn large crowds at home games as one of the best teams in their league with 11 division, two conference and three league titles. Be sure to bring a glove to the game to catch a foul ball, and come hungry for hot dogs, popcorn and other ballpark delicacies. Tulsa even hosts a professional hockey team, the Tulsa Oilers. Named after Oklahoma’s past with Black Gold, several generations of Tulsa Oilers professional hockey teams have called Tulsa home since 1926. Although the original American Hockey Association team called it quits because of World War II, the Tulsa Oilers made a comeback several times until landing their Central Hockey League team status in 1992. Today's Tulsa Oilers play under the ECHL minor league at the downtown BOK Center. This Oklahoma hockey team already boasts a 1992-93 championship, so come cheer the Oilers to victory and see some hard hitting hockey for a unique sports experience in Oklahoma. No matter what sport you’re a fan of, the Territorial Capital Sports Museum in Guthrie is sure to have something that will interest your inner sportsman. See memorabilia from famous Oklahomans who went professional including Mickey Mantle, Johnny Bench, Warren Spahn, Jim Thorpe, Troy Aikman, Steve Largent and Adrian Peterson. The Native American athlete display, guided tours, lectures and baseball camps headed by Hall-of-Famer Ferguson Jenkins make this museum a one-of-a-kind stop for sports lovers everywhere. The ASA National Softball Hall of Fame & Museum in Oklahoma City delves into the past of softball by giving a chronological history of the sport from its beginning in 1887 through the present. If you’re new to the game, the museum explains its details including differences in fast, slow and modified pitch as well as the role of the umpire. The museum also recognizes softball’s greatest players who have been inducted into the Hall of Fame and features youth and championship teams. The ASA Hall of Fame Stadium is the nation’s premier softball venue and hosts championship series every summer. Oklahoma also has a history of excellence in wrestling and gymnastics on both collegiate and Olympic levels. The Oklahoma State University campus is home to the National Wrestling Hall of Fame & Museum, which is the only museum of its kind. It carries exclusive wrestling memorabilia and photos, as well as a Wall of Champions listing more than 5,000 names of those who have achieved excellence in the sport. The International Gymnastics Hall of Fame is located inside Science Museum Oklahoma in Oklahoma City. There is an interactive gymnastics space for children and a library of gymnastics history and memorabilia dating back to 1900. You can view an extensive video collection of competitions and watercolor portraits of inductees including Oklahoman Shannon Miller, as well as art and sculptures inspired by the athletes. At Oklahoma State University in Stillwater, the Heritage Hall Sports Museum showcases four main eras in OSU sports history and features Olympians, mascots and more. The University of Oklahoma campus in Norman houses the Barry Switzer Center full of OU athletic memorabilia from the last century. Take a walk down Heisman Row to see statues of OU’s winners of the prestigious award.